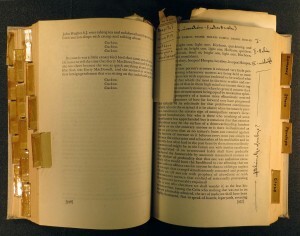 John Barth’s copy of James Joyce’s Ulysses from his undergraduate days at Johns Hopkins University. Included are his notes, bookmarks and tabulations. The Johns Hopkins University Sheridan Libraries today announced the acquisition of the John Barth Collection, which documents the creative output and career of John Barth, the American fiction writer, essayist, and teacher. Barth, a National Book Award winner, was a leading figure in the university’s Writing Seminars department, and his work is central to twentieth-century literary history, especially the development of the contemporary novel, the articulation of international postmodernism, and the identity of Maryland’s Eastern Shore in American literature. Barth is the author of seventeen novels and collections of short fiction and three collections of essays, including The Floating Opera (1956), The End of the Road (1958), The Sot-Weed Factor (1960), Giles Goat-Boy (1966), Lost in the Funhouse (1968), Chimera (1972), LETTERS (1979), The Friday Book (1984), The Tidewater Tales (1987), The Last Voyage of Somebody the Sailor (1991), The Book of Ten Nights and a Night: Eleven Stories (2004), The Development: Nine Stories (2008), and Every Third Thought: A Novel in Five Seasons (2011). In 1973, he won the National Book Award in fiction for Chimera; in 1997, he received the F. Scott Fitzgerald Award for Outstanding Achievement in American Fiction, and in 1998, he received both the Lannan Foundation Lifetime Achievement Award and the PEN/Malamud Award for Excellence in the Short Story. John Barth was born in Cambridge, Maryland, and earned his bachelor’s degree in 1951 and his master’s degree in 1952 from Johns Hopkins University. Before returning in 1973 to teach at his alma mater, he held professorships in the English Departments of the Pennsylvania State University and the State University of New York at Buffalo. Barth became Professor Emeritus at Johns Hopkins University in 1995 and was afterwards a Senior Fellow at Washington College in Chestertown, Maryland. He received an honorary Doctor of Humane Letters degree from Johns Hopkins University in 2011. “I’m pleased to have these materials at Johns Hopkins, because it was at Hopkins — and largely thanks to Hopkins and my fine undergraduate- and graduate-school professors — that I managed to become a writer,” said Barth. The collection contains the complete extant notes and manuscripts for Barth’s published writings and many of his lectures, correspondence between Barth and other major literary figures, all of the English-language editions of Barth’s work and many translations, as well as anthologies, journals, and works of criticism that include Barth’s work or scholarship about it. In addition, the collection includes most of the 1200-volume library of Barth and his wife Shelly: books belonging to Barth from his student days, with his annotations; books inscribed by students, colleagues, and important writers of the past several decades; and books that were instrumental to Barth in his own writing. The collection also includes photographs, recordings, juvenilia, and home-made posters and slides that Barth used to illustrate talks and readings. The John Barth Collection will be the subject of a major exhibition in the fall of 2015, when most of it will also be opened up to researchers. Selections from the collection can be viewed here.